In our experience, a seamless and smooth mix of all the elements involved is essential to achieving your objective. Our approach combines first-rate competences in the various areas of technology and management, with many years' experience of the hurdles and dependencies encountered in implementation, as well as a detailed understanding of all the human risk factors. 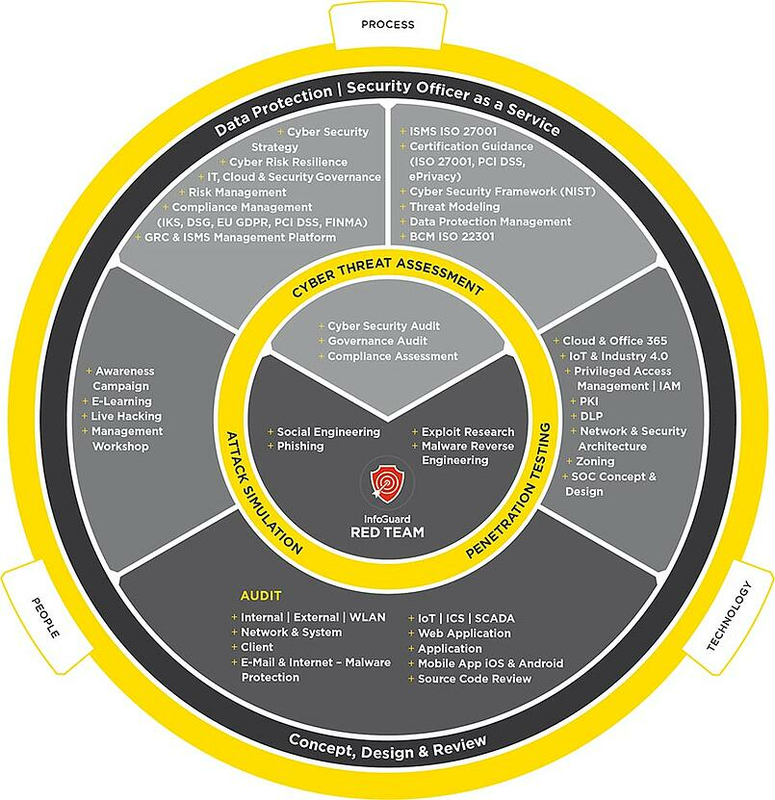 We take a holistic view of security, compliance and risk management. Be it when setting up and operating an information security management system (ISMS), effectively minimising risk, observing governance and compliance or successfully raising employee awareness: Our modular range of services embraces technology, organisation and employees in equal measure. To achieve its full potential, a well thought out concept must be implemented effectively. The situation is compounded by the constantly changing environment. Existing concepts and architectures must be regularly audited and brought into line with new technologies and types of threat. We know the challenges involved in ICT security, compliance and risk management inside out: from a well thought out architecture concept and its practical implementation in each individual area, to the uncompromising audit of the measures taken. With the ever-quickening pace of digitalisation, a greater number of security technologies are needed to protect applications and users. The knowledge of our experts is always right up to date. Depending on your specific needs, we will support you and your specialist departments, either as needed in individual processes or technology disciplines or extensively across whole areas of application. Organisations are constantly changing. New technologies, divisions and employees are integrated or areas that are no longer part of the core business are shed. The strategies used by attackers change equally fast, necessitating regular and rigorous audits of security. Our specialists know the tricks that hackers use and find the weak spots before an attacker can exploit them. The ISO-27001 certification is of enormous importance to us. Thanks to the specialists from InfoGuard our company now has a transparent and comprehensible process for handling sensitive data.